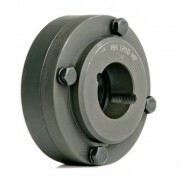 Most couplings are designed to allow for misalignment and to offer some dampening property. But sometimes you need to join two shafts together and you want a totally rigid connection. We can offer you a range of couplings that will do this job for shafts as low as 6mm and up to 300mm or larger on request. 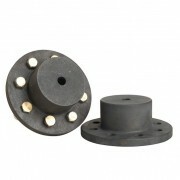 The RM rigid coupling consists of two cast iron taper lock halves, a male & female flange, fully machined. The male hubs are available with taper lock entry from the Hub side H or the Flange side F. The female hub is available only from the Flange side F. This allows two alternative coupling assemblies as drawn below. For vertical applications use FF assembly only. The GRC coupling consists of 2 rigid hubs and high tensile machine bolts. The simple construction means that the coupling is lubrication and maintenance free. 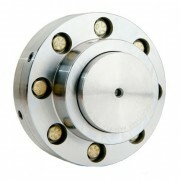 Rigid couplings are ideal for applications where there is no misalignment. 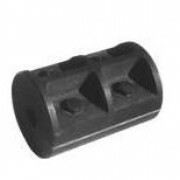 The bolt coupling is a rigid coupling. It is made of two cast iron halves, which are bolted together. The coupling is maintenance and lubrication free, and its construction prevents fretting corrosion and allows for easy installation and removal. 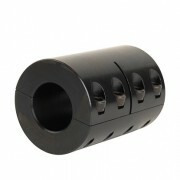 The bolt coupling can be used with or without keyways. 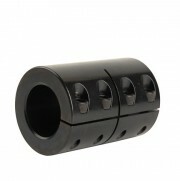 Lovejoy Rigid Sleeve coupling fit the standards of the industry. These couplings, the simplest type, provide a fixed union between two shafts which are precisely aligned. They are suitable for use in joining any two shafts when flexibility is not required, shaft alignment is maintained and proper bearing support is provided. Bore tolerances are -.000/+.002 inches. 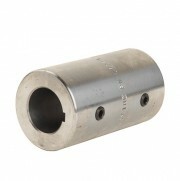 Ruland’s rigid couplings are available in one piece clamp designs, with or without keyways in steel or stainless steel. Clamp style rigid couplings wrap around the shaft, providing high torsional holding power without the shaft damage and fretting that occurs when set screw style couplings are used. Ruland’s rigid couplings are available in one and two piece clamp designs, with or without keyways in steel or stainless steel. Clamp style rigid couplings wrap around the shaft, providing high torsional holding power without the shaft damage and fretting that occurs when set screw style couplings are used. Two-piece clamp styles also allow for disassembly and maintenance without removal of other machine components and feature opposing hardware for a balanced design. The rigid coupling consists of 2 pin half's from the cone ring coupling, high tensile machine bolts and a locating ring to make sure that everything is in line. The simple construction means that the coupling is lubrication and maintenance free. Rigid couplings are ideal for applications where there is no misalignment. 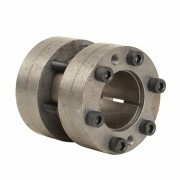 The rigid coupling is available in pilot bore and Taper bore.